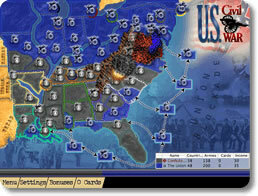 American History Lux Game - Download and Play Free Version! 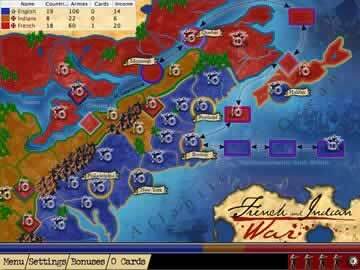 Fight in 10 wars that have shaped American history in the educational strategy game American History Lux. Download the free version, read user reviews, view screen shots, read about the game and more. Become a war hero by leading your armies against many enemies that America fought throughout history. 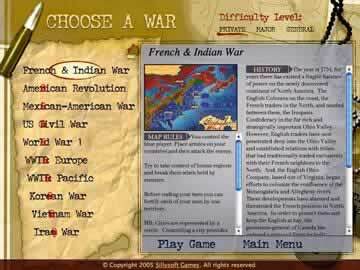 Begin by fighting the French and Indian War, battle through both World Wars, the Vietnam War, the Iraq War and five more wars that have shaped American history. If you've ever had trouble finding people to play the board game Risk with you, then you'll love this unique, historic rendition of Risk with a built-in computer opponent! Each map begins with some great historical information about the war you will fight. There are even links to Wikipedia to read more. Your armies will be arranged on the maps just like American and enemy armies were during the actual war. Strategically add new armies to your territories at the beginning of each level. Then launch as many attacks as you want on neighboring enemy territories, providing you have enough armies to defeat them! After you've finished your attacks, you can move your armies to brace yourself for the computer's strategic turn. When all of the enemy territories are yours-or if the computer has conquered all of your territories-victory is declared. Reenact each war with four difficulty levels. This game is a great educational tool because it combines important American history with a very entertaining and strategic game! The fun game is a meaningful visual tool that will help the information stick in kids' brains. This game can provide tons of strategy-building fun for people of all ages! Let history come alive now with American History Lux!